The 10-Bar fine grinder is for processing materials in explosive environments such as sugar grinding from (4X to 12X) with a single pass mill. These new mills are designed for explosion pressure shock resistance up to 10 bar (145 psi). Ideally, these mills are best suited for heat-sensitive products that require a tight distribution of particle sizes. 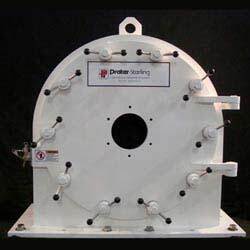 Other options with these mills include complete bearing monitoring systems that not only measure bearing temperatures and vibration but also high frequencies that allow for early warning and rapid response of premature bearing failure. Both bearings on these mills are conveniently located outside of the grinding zone which allows for a more sanitary design and the ability to monitor both bearings.